Acepromazine is a phenothiazine tranquilizer that is used prior to anesthesia and surgery because of its sedative effects and its ability to prevent vomiting. It's also used as an aid in controlling excited animals during examinations, treatments, and grooming. How it works: Acepromazine is classified as a phenothiazine neuroleptic, which means it modifies the chemicals in your pets brain to change their behavior. Its a tranquilizer that depresses the central nervous system. The mechanism of action is not exactly known, however, its thought to block receptors of dopamine in the brain, a chemical used for cell-to-cell communication. 0.25-1.0 mg/lb of body weight. Dosage may be repeated as required. View Acepromazine Drug Facts Sheet. Animal Safety: Acute and chronic toxicity studies have shown a very low order of toxicity for acepromazine maleate. A safety study using high dosages of acepromazine maleate demonstrated no adverse reactions even when administered at three times the upper limit of the recommended daily dosage (3.0 mg/lb body weight). The clinical observation for this high dosage was mild depression which disappeared in most dogs 24 hours after termination of dosing. The only occurrence of adverse reaction during numerous clinical trials was a very mild respiratory distress (reverse sneeze) which was transient and had no effect on the desired action of the drug. Contraindications: Phenothiazines may potentiate the toxicity of organophosphates. Therefore, do not use acepromazine maleate to control tremors associated with organic phosphate poisoning. Do not use in conjunction with organophosphorus vermifuges or ectoparasiticides, including flea collars. Do not use with procaine hydrochloride. Warning: Do not use in animals intended for human consumption. Precautions: Tranquilizers are potent central nervous system depressants, and they can cause marked sedation with suppression of the sympathetic nervous system. Tranquilizers can produce prolonged depression or motor restlessness when given in excessive amounts or when given to sensitive animals. Epinephrine is contraindicated for the treatment of acute hypotension produced by phenothiazine-derivative tranquilizers since the further depression of blood pressure can occur. Adverse Reactions: A few rare but serious occurrences of idiosyncratic reactions to acepromazine may occur in dogs following oral or parenteral administration. These potentially serious adverse reactions include behavioral disorders in dogs such as aggression, biting/chewing, and nervousness. What is the most important information I should know about acepromazine: Acepromazine is a prescription medicine FDA approved for veterinary use in dogs only; however it is a commonly accepted practice for veterinarians to use acepromazine in cats. Acepromazine is available as 10 mg and 25 mg tablets. Each tablet is quarter scored. The usual dose for dogs and cats is 0.25-1 mg/lb. Acepromazine may color the urine pink. Occasionally, this medication may have an opposite effect causing stimulation. Therefore this medication should not be used to treat aggression. What should I discuss with my veterinarian before giving acepromazine to my pet? Tell your veterinarian if your pet has liver disease, heart disease, seizure disorders, or if the pet is pregnant or lactating. It would be better if you also mentioned other CNS (Central Nervous System) medications such as clomipramine, fluoxetine, and Reconcile or monoamine oxidase inhibitors such as Anipryl, Selegiline, or Preventic Collar that you are giving or using on your pet. How should acepromazine be given? 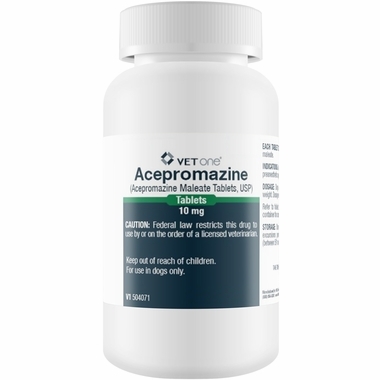 Give acepromazine exactly as directed by your veterinarian. Acepromazine should be given 45 minutes to 1 hour before the procedure for the medication to take effect. If you do not understand the directions, ask the pharmacist or veterinarian to explain them to you. What are the potential side effects of acepromazine? Stop giving acepromazine and seek emergency veterinary medical care in the event of rare allergic reaction (difficulty breathing; swelling of the lips, tongue, or face; hives). Other, less serious side effects that have been reported but may resolve with continued treatment. Continue to give acepromazine and notify your veterinarian if your pet shows signs of sedation, depression, incoordination, low blood pressure, slower heart rate, and breathing. Other side effects may also occur. Talk to your veterinarian about any side effect that seems unusual or bothersome to your pet. What happens if I miss giving a dose of acepromazine? Give the missed dose as soon as you remember during the same day. However, if you don't remember until the next day, skip the dose you missed and give only the next regularly scheduled dose. Do not give a double dose of the medication. What happens if I overdose my pet on acepromazine? Seek emergency veterinary medical treatment. Symptoms of overdose may include excess drowsiness, slow heart rate, and breathing, unsteady movement, unconsciousness, low blood pressure or seizures. What should I avoid while giving acepromazine to my pet? Do not give your pet epinephrine or CNS depressant medications such as Phenobarbital. What other drugs will affect acepromazine? Before giving acepromazine, tell your veterinarian if your pet is being given phenytoin, antiarrhythmics such as quinidine and beta blockers such as propranolol. Antidiarrheal medications and antacids may reduce the effectiveness of acepromazine.